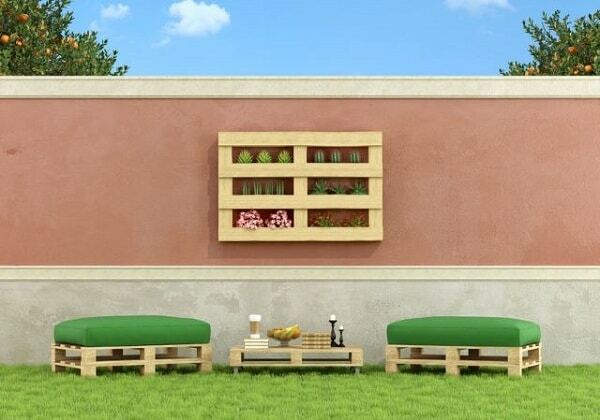 Pallet furniture is all the rage right now in outdoor (and indoor) design, not to mention it is probably the most favorite type of material for DIY aficionados. While we do get excited when we stumble upon amazing outdoor pieces of furniture, such as backyard bar sets, we cannot ignore the trend of DIY pallet patio furniture. Easy to make and requiring just a little bit of attention, such furniture pieces keep you busy, happy, and creative while you make them. They also keep you comfortable. Overall, DIY pallet patio furniture is a great way to channel your creative flow and turn your lawn and garden into a veritable corner of paradise. Polish them well so there are no splinters to bother you while you work or use them afterwards. Treat the pallets with lacquer, varnish or polyurethane to add a protective layer on the wood; since you are going to use the pallets outside, they will be vulnerable to weather conditions, rot, or wood pests; make sure the pallets are properly coated and more resilient to these environmental factors. Draw or plan your future furniture and measure the space and pallets a few times to make sure your ideas will take shape without error. 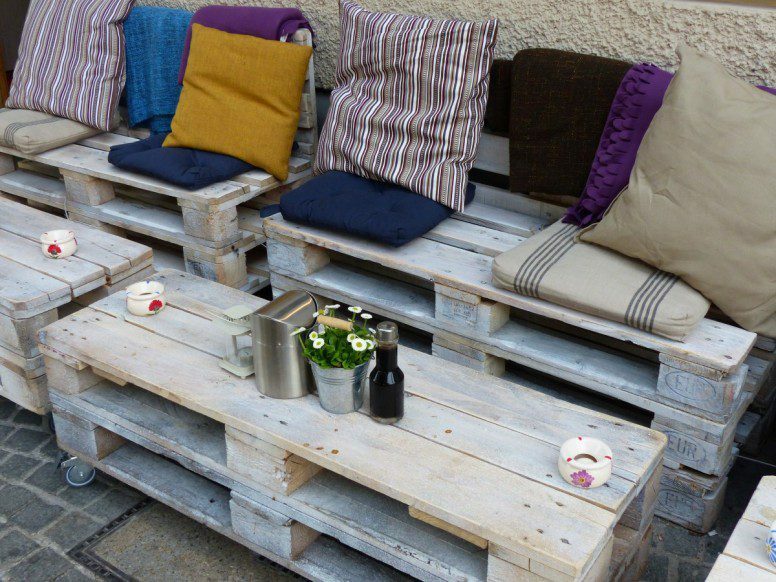 Now that you know how to prepare, it is time to see our top picks in DIY outdoor furniture pieces made with pallets. Roll up your sleeves, get your tools, and let us begin! We start with this pallet patio furniture idea, which was actually implemented on a balcony, to show you just how versatile pallets are. In order to replicate this furniture design on your patio or deck at home, you need two single pallets stands on two separated dice sections for the sofas and one pallet for the coffee table. The separate dice sections you use together with the two single pallets stands allow you to achieve a comfortable sofa height. For even more versatility and freedom, you can add wheels to the coffee table in case you might want to move it around the patio. 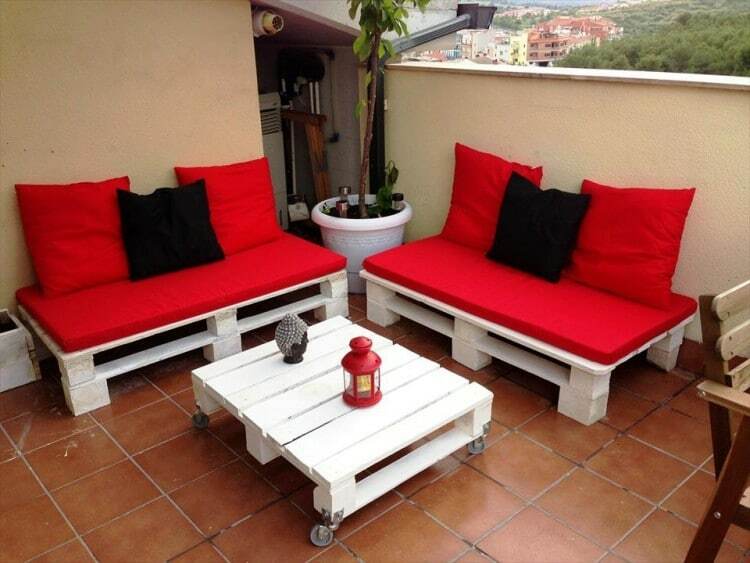 The design is simple but gorgeous: the pallets come in white paint, while the weatherproof sofas’ cushions come in bright red, with a little decorative black pillow negligently adding contrast and atmospfere. This design offers somewhat of an oriental feel to any patio, backyard, or deck. For a rustic flair, you can add a red lamp on the table. A large deck or patio coming in wooden or tile flooring needs exquisite furniture. This design is as easy to achieve as the previous one. However, it comes with some tiny details you should consider to bring comfort and beauty to your yard. In this DIY design, you also need you need two single pallets stands on two separated dice sections for the sofas for suitable height. The paint coat here comes in a warm and natural shade of wood for a rustic flair that perfectly blends in with your landscape. If a coffee table is not enough, take inspiration from this larger dining pallets-made table in the same earthy natural nuance as the sofas. For a plus of comfort, add dense foam cushions and pillows in a bright shade of green. This design is the translation of the concept “beauty in simplicity”. Mimic nature itself with the color scheme in browns and greens. 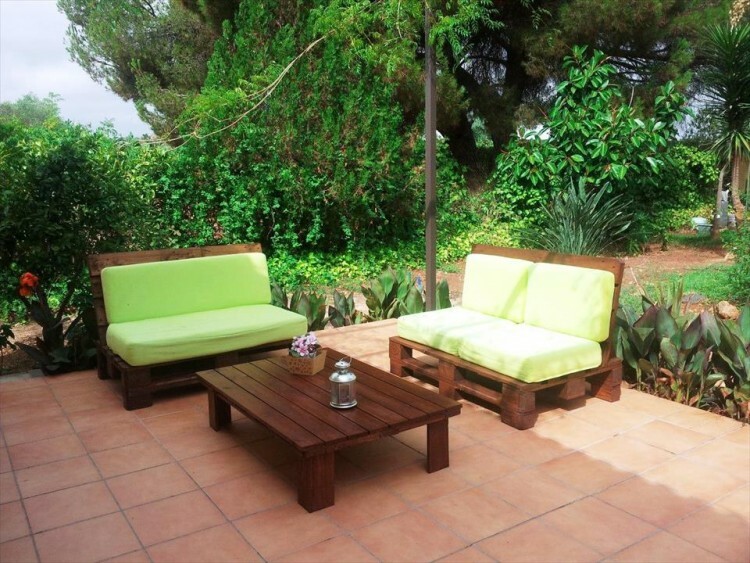 Blend the furniture in the overall outdoor space. Make sure the pallets and the cushions are safe against weather whims and you are good to receive and entertain guests on your new patio! When we think about outdoor furniture, we think about large sets with sizeable sofas, tables, chairs, a bar, and many more. But how about turning your property’s wall fence into the backdrop of your new outdoor living room? This idea is so simple it is mind-blowing! You basically need three pallets to create two loungers and a minimalist coffee table. If you want to spice things up, add a hanging plant holder or vertical garden on the wall for a dash of beauty and functionality. First thing first, make sure your backyard property wall fence looks good; if you always wanted to renovate it and revamp it, now it is the time; pick a bright color or color scheme to create a focal wall – just like in a real indoor living room. Stack the pallets on the separated dice sections for optimal height. A low-height minimalist funky table completes the design and gives it balance. Pick bright weatherproof cushions if you do not have some sort of a cover for this small corner of paradise (although a garden umbrella would do miracles). The green shades of the cushions in this design works great with the light, natural nuance of the pallets, which you can treat with light lacquer. If you want to spice things up even more and add a modern buzz to the ensemble, install a few floating shelves on the wall above the loungers to hold decorative small flowerpots for color and contrast. You can use the shelves to store everything you need to have a nice coffee moment in the morning: cloth table napkins, a box of sugar cubes, a funky jar for teaspoons, a coffee set, and so on. One thing is for sure: buy this bed from a furniture store and know it will not come cheap! 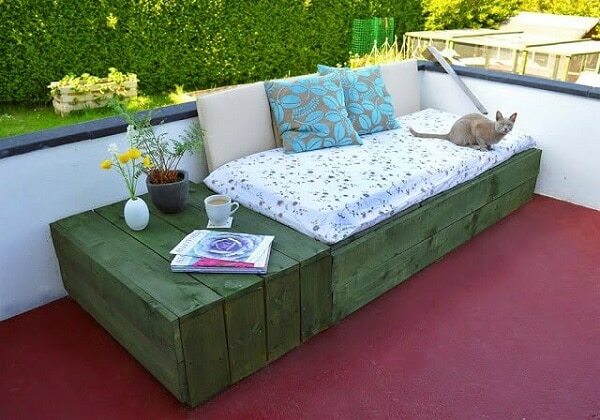 On the other hand, repurpose some pallets and you will get your dream-corner of backyard relaxation. After all, who does not want to stretch for a bit in the afternoon or spend a lazy Sunday morning reading and enjoying life? This outdoor day bed is versatile enough to build on a deck and patio or inside a balcony or apartment terrace. Before you get started, measure the available space and make sure you can properly and comfortably lie down in your new bed, calculation the space (and pallets you need) to also introduce the bedside table. Get some planks to cover the front and the sides; if one side sits against a wall, you can cut back the costs by not covering it with a plank. Coat the bed so environmental factors do not damage it and paint it in a color of your choice; a darker tint adds personality to the ensemble and a more dramatic look in contrast with brightly colored cushions. Make sure you pick a foam mattress that makes you feel like in Heaven. You can add decorative elements on the table. This type of day bed works great with a little shade for summer naps and chill out moments. You can pick an area on your backyard or patio, which comes with your own shade landscape trees or think about adding a garden tent or umbrella. If you love to entertain guests and throw garden parties (or organize board game nights), you need some well-chosen furniture. Luckily, pallets are not only versatile, but also very easy to use to build larger furniture pieces. This garden café is the perfect example that only your imagination is the limit when it comes to making garden furniture with pallets. Do you think four sofas and two tables are enough for your next social gathering? The length of the sofas and tables are totally up to you, as you need to fit them well in the available space; do not forget to leave enough room for people to move around. You can cover the sofas sitting areas with planks for more comfort or simply add colored pillows, blankets, and cushions for a more rustic flair. Moreover, you can achieve a retro repurposed look with the help of a gray tint to paint the pallet furniture. A natural wooden lacquer shade or colored paint are also great choices. For more utility and freedom of movement, endow the tables with wheels. Make sure the throw pillows, blankets, and cushions do not suffer due to weather elements. This particular furniture design works great with large, long, and narrow spaces. Tomake the best out of your patio, balcony, terrace, or deck, place the sofas and tables side by side in two facing rows. Do you have other DIY pallet patio furniture ideas? Which one of these appeals to you the most? Would you try making one (or more) of these pieces in your back yard?